A small percentage of MSPs have started carving out their place in the IoT market with monitoring and management services for connected devices, but many still wonder whether there is even a place for them. They’ll need to figure it out soon because the IoT is poised for explosive growth in the near future. By 2020, the installed base of IoT devices will reach 20.4 billion, according to Gartner, more than double the 2017 number of 8.4 billion. Meanwhile, IDC expects worldwide IoT spending will reach $772.5 billion this year, 15 percent more than the estimated $674 billion in 2017. Come 2020, that figure will surpass $1 billion, IDC says. MSPs who ignore these forecasts, and those listed in our previous post, do so at their own risk. Even if your remain unsure of how to seize IoT opportunities, it won’t be long before customers start demanding to know more about IoT and how it can benefit them. A similar pattern happened with the cloud, as customers reacted to the buzz around cloud-based technologies. If customers cannot get a satisfactory answer from you about IoT, they will turn to a competitor who will. Therefore, as MSPs you should be broaching the topic of IoT with customers, explaining the technology and proposing assessments to determine if customers are ready for the automation, monitoring and real-time analytics technologies that are the heart of IoT. In some cases, MSPs might learn that customers already have some IoT devices in place, such as IP-enabled surveillance cameras or sensors attached to equipment to measure things like temperature, humidity and vibration. If these devices aren’t properly secured and managed, they pose risks to the business if they are hacked. While the IoT opportunity is significant, it is true that MSPs face some challenges in this market. For instance, as of yet PSA (professional service automation) and RMM (remote monitoring and management) tools aren’t designed for IoT devices. That will soon change, but MSPs have no time to waste. Before IoT integrations with PSA and RMM are readily available, MSPs should look for IoT-focused monitoring platforms that are making their way into the market. There are also products, such as power management and environmental monitoring solutions, which have their own monitoring capabilities. Another potential point of entry into IoT is through DMaaS (data center management as a service), which provides visibility and analytics-based insights into hybrid and physical environments to optimize performance. It may be a few years before traditional IP monitoring tools become tidily integrated with IoT platforms, but with a little ingenuity, patience and help from product vendors, MSPs can start building their IoT practices to steer customers to a connected future. For many MSPs, the path into a lucrative IoT business is likely through the edge. As IoT implementations grow, small computer rooms and closets containing the infrastructure to run IoT applications are starting to appear at the edge of networks. Edge sites allow organizations to avoid the latency of having to connect to cloud environments for their IoT applications, which require real-time processing and analytics. Businesses will need a standards-based approach to make edge sites reliable, available and secure – and they will look to MSPs to deploy and manage them. 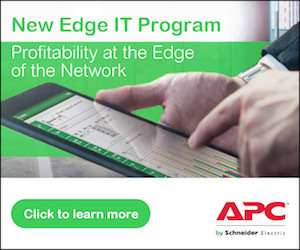 An example of solutions suitable to edge and IoT environments is APC by Schneider Electric’s EcoStruxure™ IT Gateway, which lets you assess your customers’ IT needs, and monitor and manage their environments. By paying attention to customer needs and learning about edge opportunities, MSPs can start to define their roles in the IoT market. MSPs who do so early can position themselves for future growth by addressing customer needs that most of their competitors cannot yet handle. Click here to learn more about our MSP program.